Shakespeare never wrote a play about King Arthur, and he only mentions Arthur and Merlin twice each. You’d think there wouldn’t be much to say about Arthur and Shakespeare, and in a way you’d be right. But when the University of Tehran hosted a conference on Shakespeare’s universality, I immediately thought of Arthur; not because Shakespeare had a lot to say about the legendary king, but because other writers have frequently put the two together, despite there being such a tenuous textual link. I figured that talking about why people were keen to make Shakespeare an Arthurian writer — or to make Arthur as Shakespearian character — would illustrate how far-reaching Shakespeare’s influence is, felt in a subject matter he barely wrote about. Shakespeare crosses literary traditions as much as times and national boundaries. Some writers have related Arthur and characters associated with Arthur such as Merlin, or more broadly the canon of Arthurian literature, to Shakespeare. There are four ways that this has been done. Firstly, by treating Shakespeare as a contributor to the Arthurian legend, by drawing on the scant references to Arthur and related characters found in his canonical works. Secondly, by arguing that Shakespeare was influenced by Arthurian texts even in works that seem to have no connection to the Arthurian legend. Thirdly, by attributing the Arthurian play, The Birth of Merlin, to him, and fourthly, by using fiction to make Shakespeare the writer of an Arthurian play. This last approach has been attempted honestly – through the medium of a novel – as well as dishonestly, as a forgery. It was interesting to think about how different writers have tried to do the same thing — putting Arthur and Shakespeare together — in different ways. Sometimes they reacted to the same idea or even the same line from a play. For example, David Jones cites Shakespeare’s idea that Falstaff rests ‘in Arthur’s / Bosom’ rather than Abraham’s, and refigures this in the dual-contexts of the First World War and Welsh national identity in his epic poem In Parenthesis (1937). T.H. White takes that same line and uses it to make Shakespeare one of the contributors of Arthurian literature, alongside Chaucer, Spenser, Milton, Wordsworth, and Tennyson. In citing writers, like Shakespeare, who are the corner-stones of the English literary canon, White makes the Arthurian legend seem more important and integral to English culture than it might otherwise had seemed if he had only cited Spenser and Tennyson. The fact that Shakespeare, Milton, Chaucer, and Wordsworth only ever mentioned Arthur briefly does not matter: White is essentially ‘name-dropping’ Shakespeare in order to elevate his subject. Both Jones and White quote the same line from Shakespeare but for different purposes. I finished the paper by briefly discussing Arthur Philip’s The Tragedy of Arthur, a recent novel about the discovery of a Arthurian play by Shakespeare. Philips does a great job blending fact and fiction, and even includes a made-up Arthurian play by Shakespeare at the end. I gave my paper to a packed room of Iranian students (with a few from nearby areas — Kurdistan, Kazakhstan, and India). The other two papers given in my session were fascinating, and I got some really insightful questions at the end, which will help me refine the topic in the future. My only disappointment was that I did not have more time to discuss my ideas with other students of literature, but luckily one of the conference organisers, Maryam Beyad, invited me to give the paper again a few days later, to a smaller audience of PhD students. I was able to go into more detail and could spend longer talking to the audience. Again, they were very helpful, and got me thinking about how King Arthur is received in Iran, and whether they may be possible Persian influences on the legend. 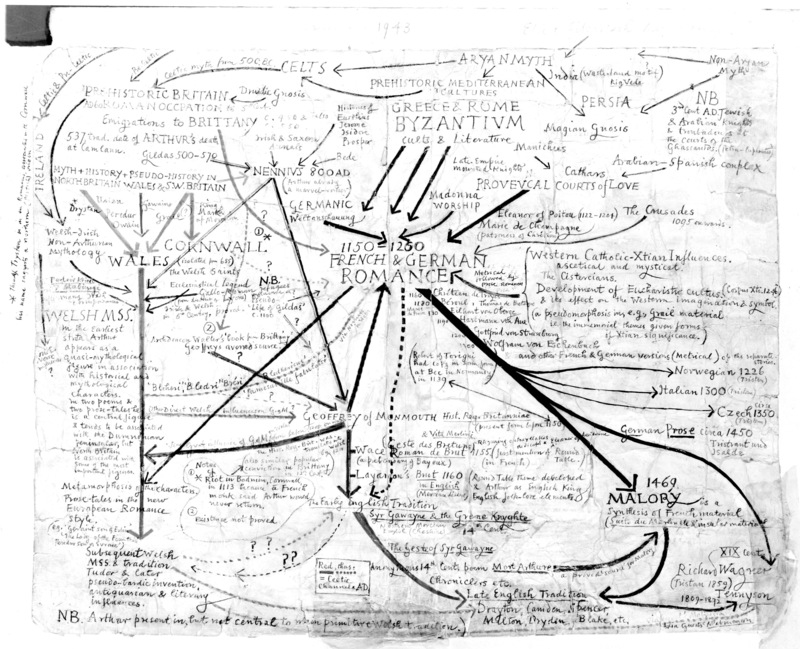 David Jones, ‘Map of Themes in the Artist’s Mind’, 1943, pencils, ink, watercolour and body colour, 20 x 24 inches, reproduced in Merlin James, David Jones 1895-1974: A Map of the Artist’s Mind (London: Humphries, 1995), pp. 50-1. The best thing about the conference was meeting Iranian English Literature students, and making some friends who I still, almost a year later, keep in frequent contact with. I had a wonderful time at the conference and had an equally enjoyable time exploring Iran (more on that in this blog post).